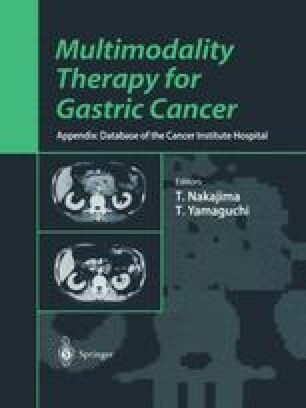 Although the results of treating gastric cancer have improved considerably as the number of early cancers has increased, at the present time most advanced gastric cancers that have invaded the serosa continue to give rise to peritoneal recurrence even when curative resection is possible . We have been using subcutaneously implanted peritoneal reservoirs to perform postoperative intraperitoneal chemotherapy, chiefly with cis-diammine dichloroplatinum (CDDP), to treat intraoperative lavage cytology-positive gastric cancers (presumed to be positive for latent peritoneal dissemination) and obviously peritoneal dissemination-positive cases. We report the results and the usefulness of CDDP herein. The terminology used in based on the 12th edition of the General Rules for the Gastric Cancer Study.